Circa is the latest casualty of a fragile digital news scene that is by no means immune to the risks facing startups in general. The mobile-native news app garnered a lot of attention when it launched in 2012 for its features that made it easier for people to follow a single news story over time. But it announced on Wednesday that it has been put on “indefinite hiatus” after running out of capital. It’s easy to see why the company made a big bet on mobile: A 2014 Pew Research Center survey found that 68% of smartphone owners at least occasionally use their device to follow breaking news events. And our analysis of comScore data from January 2015 found that 39 of the top 50 news websites had more traffic to their sites and associated applications coming from mobile devices than from desktop computers. It’s also worth noting just how quickly smartphones have flooded the market: In September of 2012, just before Circa launched, 45% of U.S. adults owned one. By the fall of 2014, that share was up to 64%. Despite the opportunity, Circa – a venture-funded news organization that did not cultivate an advertising or subscription base – was not able to garner the revenue to keep itself afloat. While venture capital interest in media companies has attracted headlines lately, their investments in journalism amount to a small fraction of total funding for the U.S. news industry. Advertising, on the other hand, accounts for about two-thirds of all news revenue, though little of that comes from digital advertising. In the mobile news economy, the clear winner is Facebook, which took in more than one-third of all U.S. mobile display revenue in 2014, according to eMarketer data. 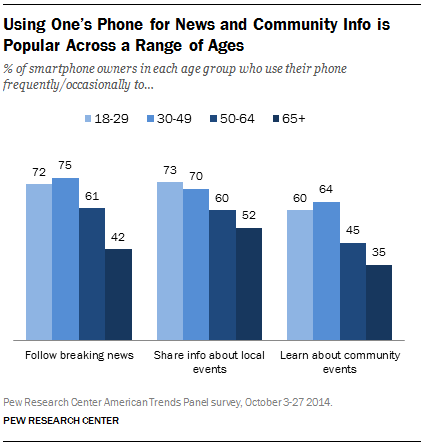 Our research shows that a sizable portion of Facebook’s user base is using the site as a source for news. The challenge for any startup is to build enough of an audience to produce a substantial revenue stream, whether in the form of subscriptions, advertisers or events, before investors lose confidence. Social networks such as Facebook, as well as digital publishers like BuzzFeed or the The Huffington Post, succeeded, and have become fixtures of the U.S. news landscape. Many others have not. Circa was not only building a product seeking to reimagine news for a mobile era – it was investing in editorial staff, which requires substantial resources of any newsroom. Venture capital can provide runway for a startup to get off the ground, but in the case of Circa, this didn’t last long enough for the company to develop a sustainable revenue stream. It won’t be the last experiment in digital journalism to meet such a fate.